A Family steps into the kingdom of God and into the supernatural. And now let's meet novelist Tom Donnan, author of One Door Between Us (Gazelle Press, November 2018). Tom Donnan died on February 6th 2006 of a heart attack. His first experience was hearing God speak to him. He said: “It is only while you are on earth that you can work for Jesus!” The paramedics brought Tom back to life, and his passion is serving the Lord. He has three children and five grandchild. Retired from a 44-year career as an elevator mechanic, he now writes, speaks, and ministers as God opens the doors. Wow, that's quite a testimony, Tom. I'm now enrolled in Global University where I hope to enter ministry. Please tell us a bit more about the plot of One Door Between Us. The book is all about what happens when God enters a family and the changes that take place with each of them. It is not just a salvation message, the supernatural side of God becomes part of their lives. The book is written to allow the reader to see what is happening on both sides, in our world and the spiritual realm. The main character, Arielle steps through two important doors in her life. One door is to lasting love and the other is answering the call of God upon her life. What is it about Arielle that will make your readers care about her? Arielle has an insatiable desire to know the truth in every story and a goal to achieve lofty educational degrees. It is her love and desire to please God that is seen through the book. Although Arielle is the named character in the book, the real woman goes on in life to walk the path God sets before her. Brave and courageous; she grows into the person God has hoped her to be. Please share with us your novel’s opening line. “Police station, this is officer Henry. How can I help you?”. I have shifted my reading list from Christian arena to diving into my text books. I have loved the Left Behind series and enjoy a good adventure novel with the unforeseen twist and turn. I remember that nonfiction-only period while working on my degree, Tom. I was so eager to get back to fiction reading once I graduated! Now that the marketing of this book has begun, I am choppin' at the bit to begin the second book in this series. Three years ago I met three dynamic lady pastors. Once I questioned them about their lives, I saw where God was ever present and very active from their beginning. Dear Reader, do you desire to know and experience God? Thank you, Tom, for visiting and telling us about yourself and your book. Readers, Tom has offered to give away a free copy of his novel. To enter, leave a comment and your email below in answer to Tom's question, above. "Please enter me" won't get you entered. Remember that U.S. subscribers are entered an additional time in each drawing. The drawing is done by email, so leave your email address, like so: trish[at]trishperry[dot]com. I experience God everyday. I’ll never know all about Him but reading my Bible helps. He has spoken to me many times in my heart and had me go places I hadn’t planned to only to find out why he sent me. 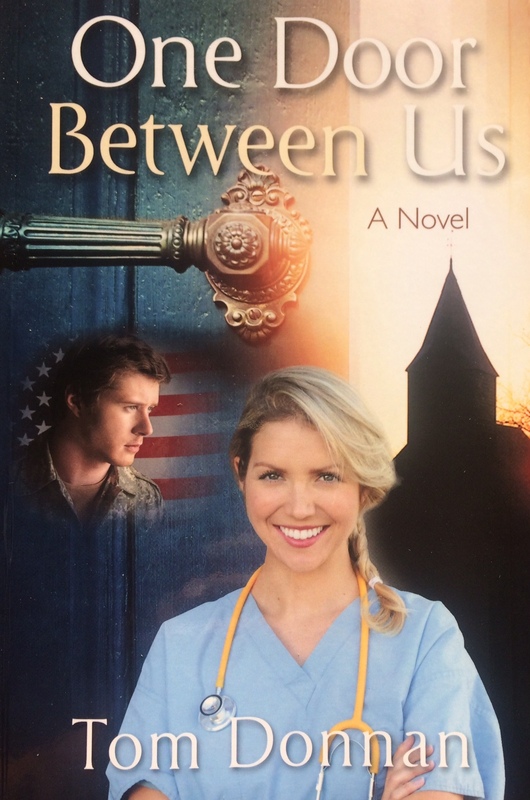 Trish, thank you for sharing the information about the book: One Door Between Us. I need to say for all those leaving comments hoping for a chance to get a copy of the story, I saw a free e-copy. The e copy has not been posted by my publisher as of yet, I will send a paperback copy to the winner. Ah, thanks for that info Tom! I’ll update the info on the post the next time I’m near my computer. Very interesting interview, I really enjoyed knowing more about the book and about the author, it really sounds like a good read . And yes I experience God every day and I talk to him everyday, Our God is an Awesome God thats for sure. God Bless you all. Hello Trish and Tom. Thank you for sharing One Door Between Us. It sounds like a must read. Yes I do desire to know more of Jesus and grow in my relationship with Him. Erin Howard and Free Books! Stephanie Morrill and Free Books! I'm Giving Away My Books!